Immediately south of Grove Road, close to the Huddersfield Narrow Canal. Passenger station is demolished. Goods warehouse is extant but derelict. Enclosed coal conveyor of former Hartshead Power Station survives adjacent to the warehouse. 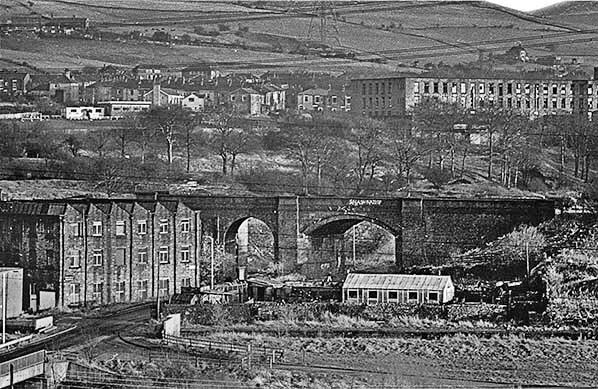 Notes: Although officially Staley & Millbrook station, reference to it as ‘Millbrook’ was made prior to its opening and the accompanying photograph from Tameside Archives is titled and listed as ‘Millbrook’; the sidings to the north which were installed to serve Hartshead Power Station were also generally given the name of Millbrook, taken from the village about ½-mile east of the station. 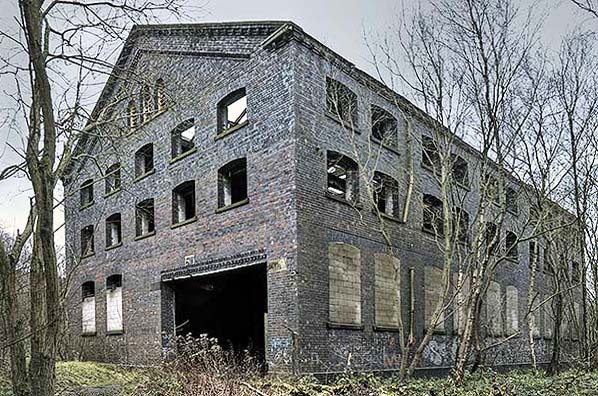 ‘Staley’ was perhaps chosen as the first name in deference to nearby Stayley Hall - the spelling used on the 1898 OS map - and Staley Mill, several hundred yards along Grove Road. Bradshaw of August 1887 further confuses the matter by listing the station as ‘Staley’ (without Millbrook) in the index, but ‘Staly’ and Millbrook in the timetable station bank. There was already a ‘Millbrook’ station on the LNWR route from Bedford to Bletchley (and another on the LSWR) so prefixing the Cheshire station name with ‘Staley’ avoided confusion - even if its spelling was a vexed question. When Staley & Millbrook station opened, there was already some population and industry in the immediate neighbourhood. Spring Grove cotton mill faced the station across Grove Road, and map evidence suggests that the railway’s viaduct sliced through the existing mill building. A terrace of three cottages, also pre-dating the railway, stood immediately north of the platforms, and Stayley Hall was about 100yd south of the station. Millbrook village, with three cotton mills, was about ten minutes’ walk uphill east of the station. Staley & Millbrook station stood on a steep slope immediately south of Spring Grove Viaduct. The two facing platforms were equipped with waiting rooms, most likely of timber construction, with glazed awnings, as is thought to have been the building style at all four of the Loop’s stations. The platforms, too, were most likely of timber construction as that material was used for the platforms at Micklehurst, where they were also on an embankment, and timber would be a much lighter load than masonry for an embankment to support. The stationmaster’s house and adjoining single-storey office range to its west faced Grove Road across a small, triangular forecourt. The station house was constructed of dark red brick with string courses of blue engineering brick and pale stone lintels. It was a dignified two-storey structure, almost square in plan, with a single-storey office range extending to the north. The roofs of both the station house and the office range were hipped and slated, with restrained cresting and finials, and a cornice was provided using a row of bricks set at 45⁰ as dentils. The original tall chimneystacks were probably of blue brick. The entrance to the house was centrally placed and was sheltered by a small, sloping porch while the passenger entrance to the office range was given a glazed, hipped verandah with a deep serrated valance. A staircase led to the up (east) platform, and the down platform was reached by means of a subway and staircase. Although both platforms were at a higher level than the main building, the down platform and its building stood on an embankment whilst the steeply rising land had to be hollowed out to make room for the opposite platform and building. As the timetables for 1887 and 1895 (above) show, Staley & Millbrook – together with the other three stations on the Loop- did not enjoy a generous service; there were no trains on Sunday. Apart from the nearby Spring Grove Mill the station had little local population to serve, and it had a short life, closing to passengers on 1 November 1909. Its neighbour to the north, Micklehurst, had already closed in 1907. The goods facilities – which continued to be used for several decades after passenger trains ceased to call - were about 500yd north of the passenger station, beyond Spring Grove Viaduct and Spring Grove Mill. The sidings and goods warehouse were located east of Hartshead Power Station (opened in 1926). The warehouse was a two-storey structure in blue engineering brick with attached mess rooms extending southwards. A 10-ton capacity yard crane was installed. The bulk of the sidings fanned out with their stop-blocks overlooking Buckton Vale Road. In LMS times six coal shoots were in place to serve a small nearby yard. In British Railways days the sidings were expanded to service the increasingly important Hartshead Power Station. An overhead conveyor was built to carry coal from ‘Millbrook’ sidings across the Micklehurst Loop, the canal and River Tame to the power station. Staley & Millbrook signal cabin was originally positioned on the down side a short distance north of the goods warehouse, almost opposite the sidings’ connection with the running lines. At some date this cabin was replaced with one of a more modern design fitted with 25 levers, still on the same side of the running lines but a little further north. Wells (1996) notes that the BR ‘standard’ type cabin was possibly paid for in part by the Central Electricity Generating Board, whose power station was served by the sidings complex; the CEGB also, reputedly, paid part of the wages of the men on duty in the cabin. 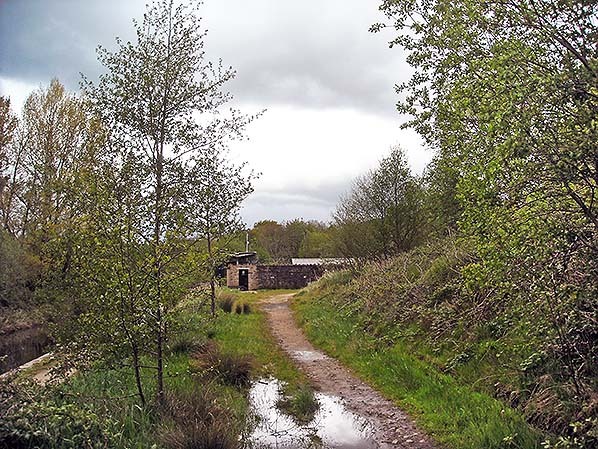 The cabin closed on 30 October 1966 although the line through Staley & Millbrook continued to serve the power station until 1972; thereafter coal deliveries to the power station were made by road. The railway remained in place for several years but was officially taken out of use on 14 July 1976 when the points at Stalybridge were clamped. Hartshead Power Station closed in October 1979 and was demolished in the late 1980s. A section of the overhead coal conveyor remains in place today, striding across the railway trackbed. Map evidence suggests that the passenger station building and covered stairway to the former up platform on Grove Road survived until at least the mid 1960s. The terrace of three cottages is also shown on the mid 1960s map, immediately west of the station house. Today, although the surrounding area is densely populated, the immediate environs of Staley & Millbrook station are conspicuously lonely and forlorn. Grove Road, which gives access to the station, is flanked by woodland and its tarmac surface is crumbling, revealing the cobbles beneath. 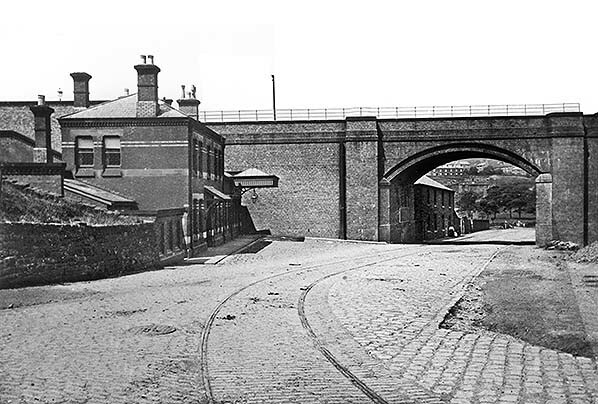 Nothing remains of the passenger station or the nearby cottages; the viaduct across the road has gone, and the embankment on which the platforms were constructed has been partially removed. To the south of Grove Road is an electricity substation and, to the north, a disused rubber mouldings factory. North of the factory the old trackbed is in use as a footpath through the woodland that has colonised the extensive site of the goods and mineral sidings. 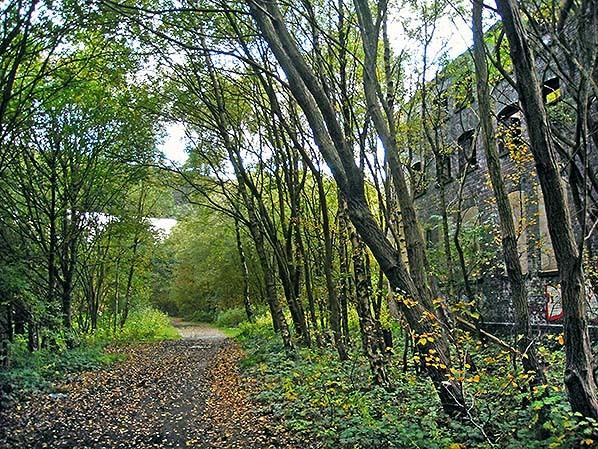 Any pedestrian who possesses the courage to enter the woodland and wander along this muddy track will be rewarded by the spectacle of the huge, derelict goods warehouse and the abandoned coal conveyor high above the path. Given present-day concerns about ‘health and safety’ it is remarkable that the warehouse with its collapsing roof and deep pits in the floor is accessible from a housing estate just a few hundred yards to the east. The warehouse can be seen from trains travelling between Mossley and Stalybridge. 1898 1: 2,500 OS map. There is a considerable distance between the passenger and goods facilities at Staley & Millbrook – a feature found at all four of the stations on the Micklehurst Loop. The passenger station is at the southern edge of the map. The station house (just south of the 404ft spot-height) and booking hall, adjoining it to the north-west are both shown to have canopies extending onto the road frontage. Covered stairways are shown either side of the lines, leading to the platforms on which buildings and canopies are seen. Immediately north of the station is a row of cottages; although the cottages might look as if they were built for railway staff they pre-date the railway. A clear impression can be gained of the difficulties in constructing this line. The station’s down (west) platform is perched on an embankment, but the steep slope has been hollowed out to make space for the up platform and building, which nevertheless are at a higher level than the station house and booking hall. A viaduct then carries the railway across the Swineshaw Brook valley and slices through Spring Grove woollen mill (shown on an 1878 map, thus pre-dating the railway). Continuing north a substantial embankment has been constructed to provide a sufficiently wide level site for the goods yard, constrained to the west by the Huddersfield Canal and the River Tame which here run side-by-side. The principal structure of the yard is the ‘Goods Shed’ (warehouse), through which two sidings pass. The weigh house is shown as an extension of the shed to the south. A yard crane is also named. 1922 1: 2,500 OS map. Staley & Millbrook passenger station closed in 1909 and is no longer named. The platforms have been removed: not a difficult task since they were probably of timber construction, and they might have been deteriorating after closure when maintenance ceased. The station building and booking hall are still shown, as is the covered stairway which formerly led to the up platform. 1964-65 1: 1,250 OS map. Staley & Millbrook passenger station building is still seen, now numbered 13 Grove Road, with the stairway to the former up platform still discernible. The pre-railway cottages (numbered 15,19 and 21) are also shown. ‘Cotton Mills’ are still named. The major difference from the earlier maps is the arrival of Hartshead coal-fired power station, west of the River Tame, and labelled only as ‘Works’. Such imprecision was OS policy – ‘security treatment’ – during the Cold War. Associated with this industrial development was the construction of Millbrook Sidings (named) to receive coal for Hartshead, and the installation of an elevated coal conveyor which crosses the Micklehurst Loop and sidings, connecting the works north-east of the ‘Goods Shed’ (warehouse) with the power station. Today (2015) all of the rails have been removed, and woodland has colonised the site. The power station has closed and been erased from the landscape. A footpath follows the course of the Micklehurst Loop, past the gaunt remains of the goods warehouse and the redundant coal conveyor. 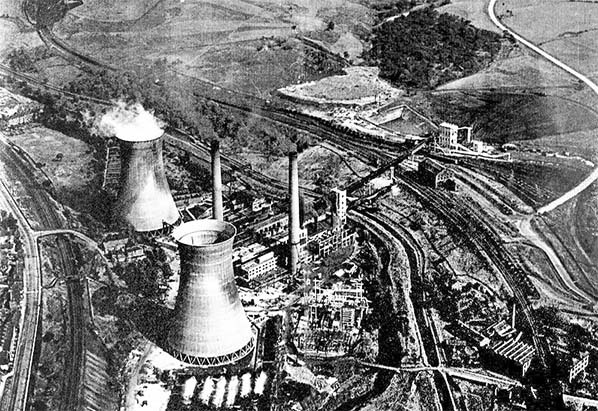 An oblique aerial view looking north towards Hartshead Power Station circa 1951. Staley & Millbrook passenger station (closed in 1909) is at the lower right corner, and the roof of the station building is just visible. The Micklehurst Loop railway on the Spring Grove Viaduct cuts through Spring Grove Mill and curves to the left past Staley & Millbrook station’s goods warehouse and yard. The extensive Millbrook Sidings are seen to the right of the warehouse; these were built to accommodate wagons bringing coal for the power station, which opened in 1926. The coal from the building at the sidings is carried on a conveyor which can be seen striding across the Micklehurst Loop, then over the canal and the River Tame to the power station, readily identified by its two tall, smoking chimneys and pair of cooling towers. To the left of the power station the original Huddersfield-Leeds railway via Mossley and the A635 road can be seen curving off the left (western) edge of the image. This view, looking south-east from Hartshead Power Station towards Staley & Millbrook station in January 1980 highlights the southern end of the Spring Grove Viaduct with its wide arch over Grove Road. Staley & Millbrook passenger station building used to stand immediately beyond this arch, and the station’s platforms were immediately to the right of the edge of the photograph. Obscuring the viaduct on the left is Spring Grove Mill, notable for its serrated roofline with ‘North Light’ windows. Staley Mill (cotton) is in the background. 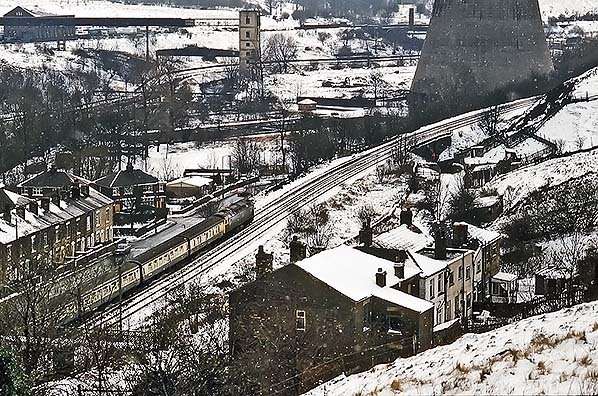 In February 1986 a southbound express on the Huddersfield-Manchester line approaches one of the cooling towers of the disused Hartshead Power Station. In this south-eastward view the warehouse of Staley & Millbrook goods station on the former Micklehurst Loop railway is in the top left corner, partly obscured by the elevated conveyor by which coal from Millbrook Sidings (beside the goods station) was moved to the power station. 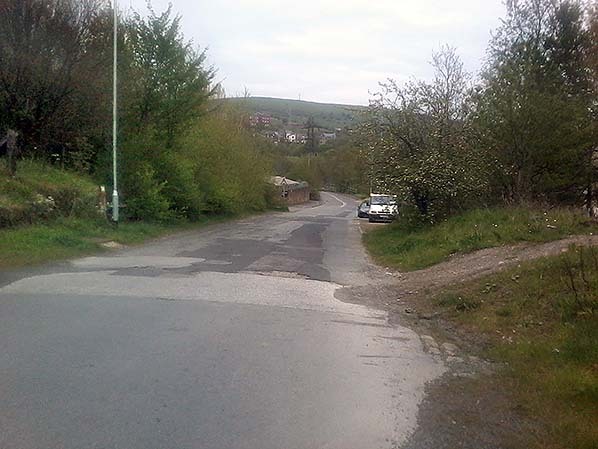 Looking west along Grove Road in May 2012 towards the site of the former Spring Grove Viaduct. The main building of Staley & Millbrook station used to stand to the left of the road, set back a little, close to the position of the lamp standard. Similar viewpoint to the 1910 picture above. Looking north at Staley & Millbrook in May 2015. The Huddersfield Narrow Canal is on the left. The station’s down (west) platform used to stand on the embankment to the right; however at this place the embankment has been lowered and it slopes downward to the point where it used to abut Spring Grove Viaduct, which has been demolished. This view is looking north along the footpath that follows the course of the Micklehurst Loop railway. In October 2015 the disused goods warehouse of Staley & Millbrook station, seen to the right, is extant but decaying. The structure in the sky about 100yd ahead is the remains of the conveyor by which coal was moved from Millbrook Sidings to Hartshead Power Station. It has been out of use since the 1970s. 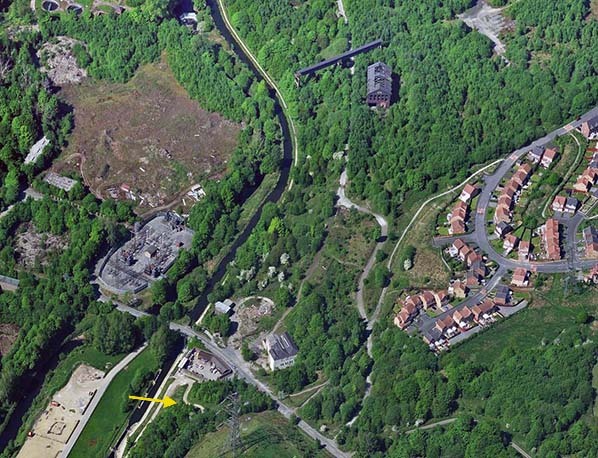 A recent aerial view of Staley & Millbrook station: north is towards the top of the image. The course of the Micklehurst Loop railway curves from south to north. Nothing remains of the passenger station building, demolished in the 1960s, or of its platforms (indicated by the arrow) which were partly on a dismantled embankment. A footpath follows the course of the railway past the derelict goods warehouse; its roof is in a bad way. A section of a disused overhead conveyor crosses the trackbed of the railway just north of the warehouse; this was the means by which coal was taken from Millbrook Sidings (now invaded by woodland) and across the canal and River Tame to Hartshead Power Station, which closed in 1979 and is now a large empty site seen north of the zig-zag of Spring Bank Lane.